The Saco fire chief says battling an early-morning fire that destroyed two condos was more difficult because of the frigid conditions, but no one was injured. The fire department was alerted to the fire in the Baywood Colony condominiums at 311 Seaside Ave. when a fire alarm sounded at 1:30 a.m. Heavy fire was showing in the second floor and through the roof when fire crews arrived. 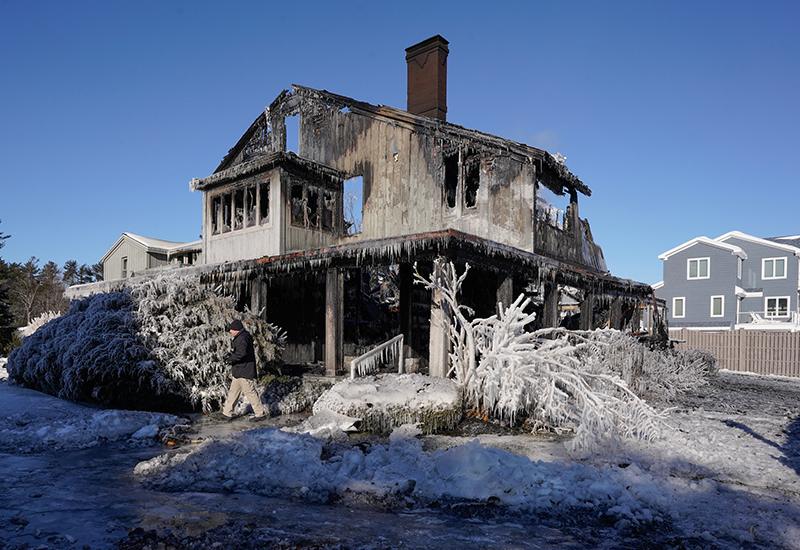 Firefighters were still putting out hot spots at 8:30 a.m.
Fire Chief John Duross said the single-digit temperatures, wind and icy conditions were a challenge for firefighters as they worked to put out the blaze. A few firefighters slipped and fell at the scene, but no one has reported an injury, he said. The two-unit condo was unoccupied when the fire broke out, he said. Duross said the state Fire Marshal’s Office will assist with the investigation into the fire, which is not considered suspicious. Crews from Saco, Biddeford, Old Orchard Beach, Goodwins Mills and Scarborough responded to the scene.